Welcome to Week 3 of the Spring 2018 edition of The One Room Challenge HERE! I can’t believe we are half way through the event already. This incredible challenge happens twice a year, and is hosted by Linda at “Calling It Home” HERE and media partner “House Beautiful” HERE. If you are joining for the first time, welcome! I am happy to have you look around. You can catch up on my guest participation, the before pictures, and project details from the prior weeks below. Our basement bar area is looking pretty interesting. I decided to outsource the job instead of trying to do it myself. 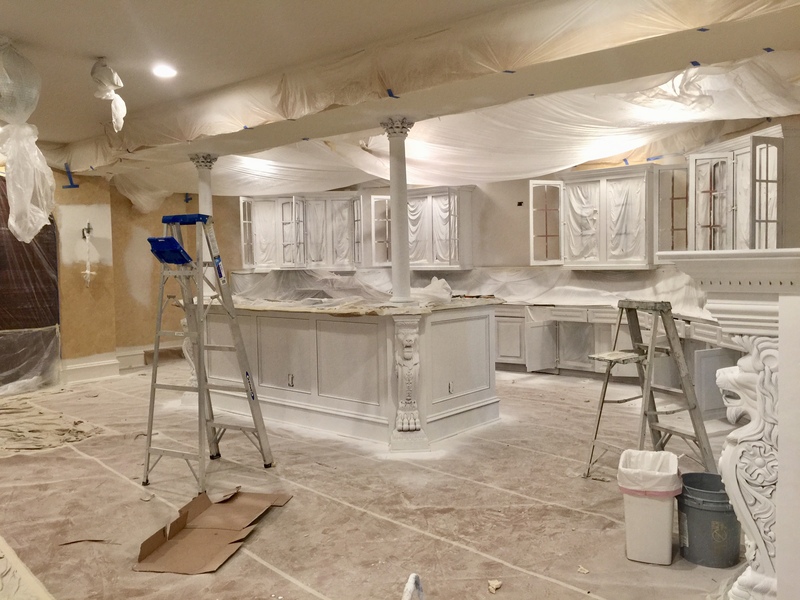 The job entails sanding, painting the cabinets, painting the island, walls, ceiling, crown moldings, and base boards. This is a really big job and is estimated to take about 10 days. The crown molding was the first to be painted. My painters are using a spray gun for the job..which goes on a lot quicker than me trying to hand paint all the detail on those moldings. The preparation work for this job took a couple days. The ceiling, lights, and insides of the cabinets are covered with plastic and the floors are covered with brown paper. All nail holes on the walls have been filled and new caulk applied to all the crown molding and base boards. The baseboards were painted and the island sanded and primed along with the old hardware being removed from the cabinet doors. My painters are using Benjamin Moore Advance Primer HERE. I have used this primer with other projects (HERE) for painting cabinets and definitely recommend the product. But as much as I would appreciate your support and your purchase through my affiliate link, (where I earn a small commission), I can’t recommend you buy this primer from Amazon due to the high price. While the primer is expensive…you can get it a lot cheaper in the Benjamin Moore Store. After sanding, the Advance primer is sprayed on all the upper and lower cabinet doors. Every inch of space not being painted, has been covered for protection. The glass panes have been removed from the doors as well prior to sanding. And all the contents of the cabinets, such as glasses and bottles have been removed. Lastly, the fireplace surround was also sanded and primed. The entire area looks really wild and I’m happy to report the project is on schedule. Check back next week to see the painted cabinets and the color we chose. Previous Post Visiting the Cherry Blossoms in Washington D.C.
Next Post Cherry Blossom Branches – Washington D.C.
Jeebus…Seeing these pictures! I did not realize what a big project this is that you have undertaken. Wow!!!!!! That is one amazing space! Thanks, we like it! And it will be even better once painted and modernized. Thanks for visiting. Shouldn’t the interiors of the cabinets where you have glass doors been sprayed too? Hi Linda, you are right but I’m still trying to decide on the color. Initially I wanted the inside a different color than the exterior of the cabinets..but now I am starting to rethink that. It’s such a huge difference! It’s going to be beautiful. Isn’t it!?! Crazy how paint can transform a room! Looks so much better in the light color! Really brightens the space!! Doesn’t it! Always surprised at how paint transforms a space so easily. This is your basement?! It’s bigger than my main floor! Haha.